A step-by-step guide to making the ultimate DIY garden container. Hypertufa containers - also known as troughs - are rustic, striking, versatile, and perfect for small, Alpine plants. A mix of cement, perlite, peat, and water, they are simple and affordable to make at home. Hypertufa Containers details everything a home gardeners needs to know to make their own troughs and successfully garden in them. Readers will discover the amazing variety of plants that thrive in troughs. Plant portraits include growing and cultivation information along with potting tips. 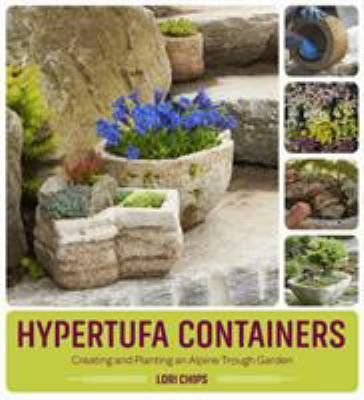 The book features step-by-step instructions for making hypertufa containers in a variety of shapes and sizes. The instructions are easy to follow and feature colour photography. Hypertufa Containers is for container gardeners, rock gardeners, and people looking for a new DIY project. AUTHOR: Lori Chips is the alpine manager at Oliver Nurseries in Fairfield, Connecticut. She studied at the School of Horticulture at the New York Botanical Garden. Also a botanical artist and illustrator, she has judged the Philadelphia Flower Show and writes for the North American Rock Garden Society. A national expert and specialist in alpine and trough gardening, Lori says, "plant enthusiasm is contagious."